Discover the enchanting love stories set in the charming town of HERON’S LANDING, Missouri, where romance blossoms alongside the bountiful town vineyards. Each book is connected but can be read as a standalone. When Kat Williamson moves to Heron’s Landing in order to care for her ailing grandmother, the last thing she’s looking for is trouble--or love. But Gavin Danvers, the father of one of her students, sparks a heat in her that can’t be ignored. Still, he’s in the middle of a divorce, so she tries to keep her distance…until a game she designed subjects her to ever-escalating threats. Gavin blames himself for his inability to save his ex-wife from her mental illness. No matter how much he wants Kat, he doesn’t think he deserves her. After she finds his daughter hiding in a supply closet at school, the two of them work together to help Emma cope. And when Gavin learns that Kat is being threatened, he insists on protecting her. They quickly grow closer, but then an unexpected enemy threatens everything he holds dear. Gavin must conquer his fears—or stay locked forever in a loveless prison. 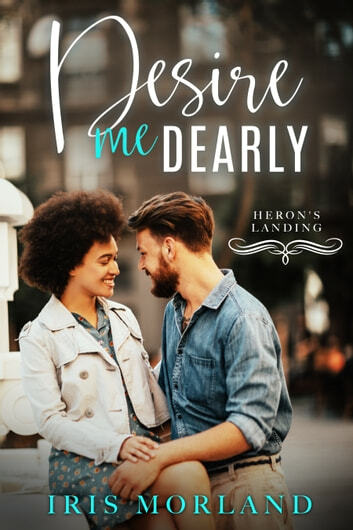 A three-star review on Heron’s Landing 3 Desire Me Dearly by Iris Morland Kat is a computer programmer who moves to Heron’s Landing to take care of her dying grandmother. She takes a job in a school to teach the children how to use the computer. One of her students is Emma, a little girl who suffers from anxiety disorder. Gavin is Emma’s dad. After his wife attempt to commit suicide in front of her daughter, they got a divorce. Gavin is full of anger and fear. The storyline is good but the execution not so much. Gavin is very rude. He feels he failed his wife and he is angry with his brother for not being with him through his ordeal. At the same time, he is angry with the teachers calling her daughter odd and with the whole world. I don’t like how he treats Kat. I like best Kat. She is caring and sweet. However, the part about her game posted on the Internet is not very credible. How is it that she only received bad comments from men? I think it is too out of the contest. The best part of the book is the end. It is quick, with a hint of mystery and interesting. All in all, I enjoyed the book. I thought this story was interesting and lots of details about the story. I really liked the story line and where the story was going, it wasn't all over the place. The author wrote a very good story it made me interested to read more of her stories.